I am supremely uninformed about all things Southeast. My experience with this region of the country can be boiled down to, well, nothing. When my good friend Bekah plied me to her neck of the woods with a backpacking trip along the length of the Appalachian Trail (AT) through Great Smoky Mountains National Park, I knew I’d learn fast. Ours was a 72-mile journey, from Fontana Dam in the southwest to Davenport Gap in the northeast part of the park. Dropped off after dark on Wednesday night, October 12th, we hiked for the next six full days and the edge of one more, finishing on the morning of Wednesday, October 19th. Bekah and I at our after-dark, Fontana Dam drop-off (photo courtesy of Meghan M. Hicks). After overnighting at the Fontana Dam backpacker’s shelter, we chatted with another backpacker, a fellow who called himself Burt. We listened incredulously as he explained in about 13 different ways that, because we were girls, we’d never complete our day’s mileage goal, let alone our plan to hike the park’s distance. Me at the Fontana Dam Trailhead (Rebekah Henderson photo credit). 2. Fall leaf color is the shiz-nit of awesomeness in Great Smoky Mountains National Park. Bekah hikes it out through Exhibit A of awesome leaf color (Meghan M. Hicks photo credit). Me and Exhibit B of leaf color (Rebekah Henderson photo credit). 3. The hatred of lightning leads to fortuitous circumstance. Our Day 1 was a 13-ish mile hike to the Russell Field Shelter, and it involved a continuous climb of 4,000 odd vertical feet. The day’s weather was a mix of sun, fog, sprinkles, downpouring rain, and a couple oddball thunderstorms. The final three miles of the day involved time spent on the highest ridge around, and because I hatelightningsoverymuch, we took a 45-minute timeout from a thunderstorm at the Mollies Ridge Shelter. There, we met and chatted with three folks with whom we’d share good trail times in the next week, Al, Linda, and T-Bone. Without those hot, white flashes and the sweet people we met while hiding from them, the week could have taken a different spin. 4. People sing the Osborne Brothers’ song on Rocky Top. We spent part of Day Two traversing two balds called Rocky Top and Thunderhead Mountain. Trees yield to grass and worldly views on these balds. We climbed up Rocky Top with a group of day hikers dressed in Tennessee clothes. When they reached the summit, they sang the song about moonshine stills and home-sweet-home. It was an obscenely Southeastern moment. Departing the Russell Field shelter on the morning of Day 2 (photo courtesy of Rebekah Henderson). Bekah taking a break from singing on Rocky Top (Meghan M. Hicks photo credit). 5. Wild is differently defined in Great Smoky Mountains National Park. While through-hiking the AT in the park, the National Park Service mandates you sleep in shelters. Some nights, we shared the shelters with four other people. One night, there was a miraculous 20 people in one of them. Each shelter had a water source of sorts, typically a pipe directly connected to an underground spring. To call the trail a wilderness experience is a too-far stretch. But that doesn’t mean there isn’t beauty everywhere. Here's the water source at the Double Spring Gap Shelter, a PVC pipe (Meghan M. Hicks photo credit)! Sunset from the Double Spring Gap Shelter (Meghan M. Hicks photo credit). We traversed Clingmans Dome on the morning of Day Four, a popular viewpoint for Great Smoky Mountains National Park day-use visitors. We found oodles of folks gawking from the observation tower at its 6,643-foot summit. Two young girls up there asked if they could try on our packs. They walked around the observation tower, carrying our 40-pound packs (with the help of their parents). With that, two future backpackers were born and they were GIRLS! Bekah and I find some girl power on Clingmans Dome (photo courtesy of Rebekah Henderson). 7. Friendship makes the miles pass. Sometime after Clingmans Dome, our trail acquiantances, Al and Linda, happened upon us. We’d met them while waiting out a thunderstorm on Day One, then shared a shelter with them a night or so later. Our friendship had blossomed, so when we randomly met in the woods, we spent a couple hours walking together. Our paths diverged one last time later this day, but they fed us chocolate and crackers before we walked different ways. I’m easily won over by food, so these folks are going to be my friends for a long time. Bekah, Al, and Linda take a break where the trail meets a scenic pullout (Meghan M. Hicks photo credit). 8. These mountains have a bunion and that’s just weird. In Great Smoky Mountains National Park, there’s a rocky outcrop called Charlies Bunion. I think it’s named after a nasty-footed Charlie who I imagine still rolls in his grave over his odd claim to fame. We visited the namesake rocks on the morning of Day Five, and the place is just as odd as it sounds. Here's me hanging out on Charlies Bunion (Rebekah Henderson photo credit). The view from Charlies Bunion is a good one (Meghan M. Hicks photo credit). 9. I found a new-to-me kind of beauty. The morning of Day 6 and its beauty need no introduction (Meghan M. Hicks photo credit). She’s beautiful, strong, thoughtful, detail-oriented, loving, tuned into others and the world, gentle, goofy as sh$t, smart, oriented toward goals, and a perfect wilderness companion. If I ever have to be locked in a closet with someone forever, I pray it be her. Somehow, she would figure out how to make a closet life fun. Bekah and I pose on the Mt. Cammerer Lookout, where we had lunch on Day Six (Rebekah Henderson photo credit). Sometimes, Bekah was so silly that I, literally, could not walk from laughing so hard (Meghan M. Hicks photo credit). 11. Fall leaf color is (still) the shiz-nit of awesomeness. Leaf color above the Davenport Gap Shelter, where we slept on Day Six (Meghan M. Hicks photo credit). We met T-Bone (This was his trail nickname. His real name? I’m not certain.) on Day One. Then, we slept at the same shelter as him for, count ’em, three nights. We got to know him and his life story, piece-by-piece, day-by-day. He also learned ours, it seems. Where our hike ended, where the Appalachian Trail leaves Great Smoky Mountains National Park, his was continuing northward for another month or so. On our last, shared night at the Davenport Gap Shelter, T-Bone gave Bekah a wedding gift (She’s getting married soon! ), a poem wrapped with twine and a fallen leaf. We’ll probably never see or hear from T-Bone again, but that doesn’t mean we’ll forget him. T-Bone gives Bekah her wedding gift (Meghan M. Hicks photo credit). 13. It never rains on our parade. Bekah is one of the most positive people I know. Our short hike out to the trailhead on the morning of Day Seven was a wet one. A torrent of rain piled down, but I don’t think we felt a drop of it. Bekah and I finish our backpacking trip through Great Smoky Mountains National Park (photo courtesy of Meghan M. Hicks). That sounds like a perfect 8 days! Did you tell that guy about the distance we covered each day? Geez. Danni, this man was to be told nothing. He had ears, but I don’t believe they actually functioned. I would have liked to see you duel intellectually with him. I love the bits about misogyny, so funny! I am so jealous of your trip and recall similar trips of my own that built me into the woman I am today. Keep trekking! Marine_AT_Hiker, thanks for your visit and comment! Every day we called our experience on the AT a cultural one. There’s so much history to the trail as well as a millionzillion good stories amongst the folks walking it. I enjoyed folks’ company and the stories they added to the mix! Great report and love the pics – expecially the one of the tall trees at sunset! I’ve wanted to visit the Smokey Mountains for years and finally one of my good friends is getting married there next May! Hope that misinformed guy reads your blog some day! Helen, hi! It’s nice to “see” you and thanks! John, best of luck to you on your winter hike and, even more, your Afghanistan deployment. You’ll, no doubt, enjoy and find peace on that Appalachian Trail. Thank you for serving our country. Great story. I stumbled upon your blog while planning my trip. I am heading to GSMNP during spring break to do a through hike along the Benton Mackaye trail- same starting point and destination as you but different path. I am pretty excited about it. I’ll post a blog about it on my site in mid April. We were dropped off and picked up by friends, dropped off near Fontana Dam and picked up where the Appalachian Trail crosses under Interstate 40 near Davenport Gap. There has to be local shuttle services, perhaps out of Gatlinburg? Best to you in your planning. It’s a gorgeous stretch of trail! Meghan, enjoyed this blog post as I am researching doing the same hike. How would you describe your pace? Seems that most folks take about 7 days to do this section; could it be done and enjoyed in 5? I know there is pretty significant elevation change; we are experienced hikers. thanks! Definitely this section could be done in five days by experienced backpackers. Our pace was leisurely, maybe five or six hours of walking each day. Enjoy! I’m planning a 10 day trip currently and looking at my potential itineraries wondering if I’d be able to comfortably cover the miles, having never dealt with such large elevation changes. I feel much more confident in my plans now! Thanks for writing this! I really loved reading about your trip! My husband and I are in the beginning stages of planning an 8 day trip through the Smoky Mountains this fall. We are combining it with a trip to visit relatives in Statesville and my dad is going to pick us up when done so we just have to figure out a good place to fly into/shuttle to/start. Right now we’re thinking of flying into Knoxville. One thing I’m trying to figure out is whether we should go straight through and do a straight AT route like you guys did (from Fontana to Davenport) or if we should start a little farther north (like maybe start at Cades/Townsend or Tremont and hike to AT from there and add in some loop hikes along the way.) Were there any trails off the AT that you wish you had time to do? Misogyny? 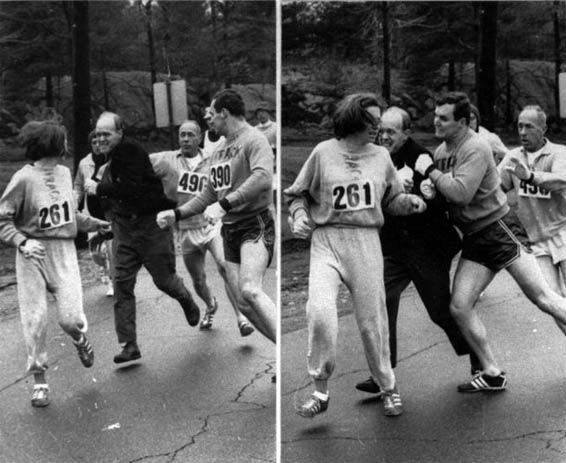 Why, you’re the Kathrine Switzer of the AT! When I started the Appalachian Trail trail in GA, on day two, a southbound section hiker stopped to chat while I was getting some water at a creek. He was a large fellow, probably twice my weight if not more. I think he thought he was some kind of trail expert. He rudely f*rted, then said I’d never be able to do 20 miles a day. Once I got him out of my head (and my lungs), I did just that. Later up in a Delaware Water Gap hostel, a guy in a cast told me not to think it will take less than 9 days to finish the Whites. (I saw it coming this time and braced for impact). I did it in 5. An *angry* 5.
Who are all these challenged people placing weights on our backs, and from under which rock do they come? I’m looking at doing the same hike that you did starting in August. I am new to hiking, but I am training. I’m relatively young and still slightly athletic. I was wondering if you had any thoughts or tips?? Anything you could give would be great. Hope this advice catches you in time for your trip. My experience in SMNP was a couple close encounters with at least two bears, one interested in my spaghetti at the first south end camping area of SMNP, the one where the shelter was removed, and later on the trail coming over a ridge, both about 20 feet. They tend to be used to people and don’t scare easily, but they didn’t attempt to get my food or attack either. I think the rule in SMNP is, you have to camp at designated camping areas, and my experience has been, wherever there is frequent food, there are mice, shelter or no shelter. I got a mouse hole in my pack’s belt pocket at Spy Rock near Montebello, VA. Camping area, no shelter but the mice have a lot of experience teaching them food is in those packs nevertheless. Colored wrappers in net pockets is like artificial bait. Birds will swoop on transparent ziplocs with food packed in them. You’re going a couple months earlier than I did. I don’t know when bears come out of hibernation in the park. You might check up on that with SMNP park rangers.